The fishery is made up of six fishing lakes that contain tench, crucian carp, bream, roach, rudd, perch, gudgeon, eels, mirror carp and common carp. There are several car parks on site and vehicular access is by key only, making it very safe car parking. While four of the lakes hold predominantly silver fish there is also a lake that is devoted to specimen carp, with a limited number of night fishing permits available. A sixth pond has a high stock density, holding a large number of small carp in addition to silver fish. For anyone especially interested in match fishing the club hosts one of the most extensive match programmes around with members only competitions being held almost every week throughout both the summer and winter, both at the ponds and on local venues. Membership is open to all but is only available on an annual basis. 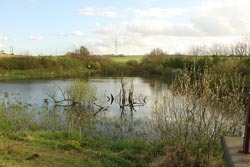 Club members also have free access to all Kilnhurst and District AA waters at Baker's pond, the river Don and the S. Yorks. Navigation Canal. All the information provided on UKCF is correct to the best of our knowledge. If there are any errors, please let us know and we will correct them. Also, if you own or know of a fishery that we have not listed, get in touch.